I believe many growth investors continue to make common mistakes that get in their way of building a robust portfolio that works for them. Today, I address three of the key "don'ts" in investing: chasing the trend, dollar-cost averaging and buying an S&P 500 index fund. I also share my preferred approach to building a portfolio that should perform better, on a risk-adjusted basis, over the long run. depending on the level of sophistication, using "healthy" doses of leverage to boost the returns of the lower-risk profile portfolio. Unfortunately, I believe many still fail to spend enough time and effort in the crucial task of developing their own "investment system". Instead, a large number of investors continue to make common mistakes, often echoed and supported by money managing "experts", that get in their way of building a robust portfolio that works for them. So, to celebrate a milestone of 1,000 articles published on Seeking Alpha (plus 135 pieces written exclusively to my Storm-Resistant Growth community), I will discuss three common but toxic habits that I believe investors, perhaps requiring a bit of a contrarian attitude, should try to avoid. At the end of each section, I briefly summarize how I sidestep each of the traps discussed using my preferred investment approach described above. Without further ado, let's dive right in. The human mind has limitations, one of which is the inability to foresee the future accurately. To compensate for the shortfall, I believe our instincts have evolved to look at past events and, maybe for the sake of simplicity, expect them to repeat in the future. If a lion was spotted roaming the grassy fields of the savanna yesterday, you stayed clear of danger: It would likely show up again soon in that same area. Maybe this line of thinking helped us to survive our early hominid years. But as the well-known disclaimer suggests, past performance is not indicative of future results. In the investment world, a group of stocks that have been climbing lately might not necessarily continue to do so, while a soft market is not always doomed to head lower for much longer. Therefore, the "rear view mirror" approach to investing does not always work, particularly in regards to predictions of the near-term future. To illustrate the idea, I propose the following investment strategy: every time the S&P 500 (SPY) crosses its own 50-day moving average on the way up, buy the market. When it crosses the line on the way down, sell the market and hold cash instruments that yield 2% per year. Relying on moving averages to identify trading signals is a common strategy used in technical analysis (a.k.a. chart reading), and closely mimics a "chase the trend" approach to investing. The graph below illustrates the performance of the 50-day moving average methodology over the past 25 years. For comparison, I have also added a benchmark approach of simply buying and holding SPY (blue line), along with a similar strategy that uses the 200-day moving average instead (grey line). 1. Inferior results: jumping in and out of the markets by chasing the trends has proven to be a losing strategy over the past quarter century. 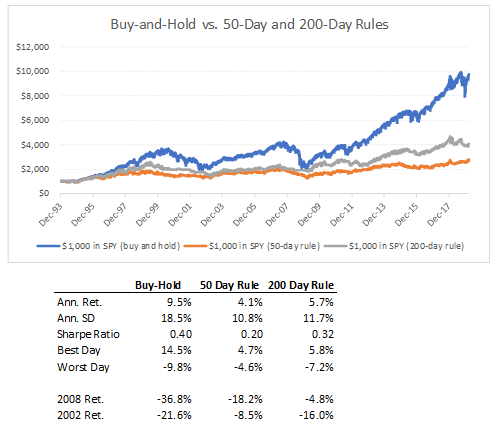 The 50-day rule would have produced absolute annual returns of only 4.1%, less than half that of the S&P 500. The approach would have also severely underperformed on a risk adjusted basis: Sharpe ratio of 0.20 vs. the broad market's 0.40. 2. Better downside protection: one desirable byproduct of chasing the trend seems to be better protection from sizable losses. 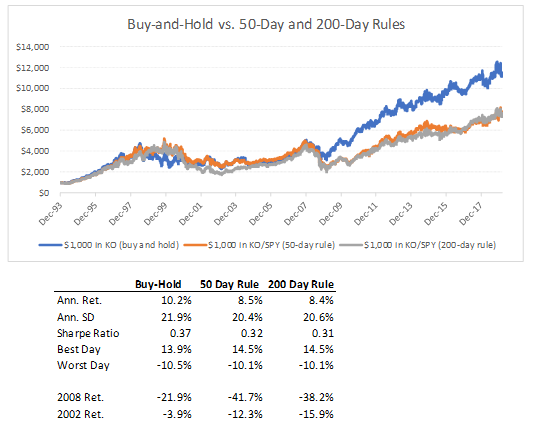 The 50-day approach experienced annualized volatility of 10.8% vs. the buy-and-hold's 18.5%. It dipped a maximum of 4.6% on any given day during the period, only half as bad as the S&P 500's worst drop, while weathering the 2002 and 2008 bear years substantially better. What probably best explains the phenomenon above is the tendency of a "chase the trend" portfolio to stay on the sidelines for long periods of time, holding safe but low-yielding cash instruments. The graphs below depict how many days, out of over 6,000 in the backtest sample, that the 50-day and the 200-day investment strategies would have been exposed to cash vs. riskier stocks. But chasing the trend does not mean that an investor needs to be either in or out of equities in general. For example, one might choose to observe the moving averages at an individual stock level and shift a portfolio's allocation among stocks accordingly, staying fully invested in risky assets at all times. Here's a variation of the original trend-chasing exercise: Suppose a portfolio that starts off holding Coca-Cola (KO) stock only. When the share price crosses its 50-day or 200-day moving average, a trading signal is triggered (buy KO on the way up, sell on the way down). When the portfolio is not invested in KO, it holds SPY, in this case a proxy for "any stock other than KO". I chose KO in this example for a number of reasons: (1) its absolute returns have been comparable to those of the S&P 500 since the early 1990s, and (2) its correlation with the broad market has been pretty low at 0.49, which I believe might increase the chances of a portfolio producing better results when it divests of KO to buy SPY. See chart and table below with the results of the backtest. Notice that, even when the cash-holding element of the strategy is eliminated, chasing trends still seems to be an underperforming investment approach. In this particular case, selling a defensive stock to buy the S&P 500 precisely when the market was undergoing a bear period proved to be a bad decision, and increased the portfolio's exposure to large losses in 2002 and 2008. The exercise above could be done with a number of different stocks and tweaks to the strategy. In some cases and for a certain period of time, chasing trends might have worked - and may again in the future. But in general, I believe that investors are better off spending their time and energy mulling over more important topics, including (but not limited to) how to better balance their portfolios. I believe that a more passive strategy to investing makes more sense than relying on recent trends to "guesstimate" the near-term direction of the markets. For my proposed hands-off approach to work best, growth investors should think hard about asset allocation ahead of time, so as to ensure that a portfolio is properly balanced and set up to climb steadily over the long run. In my multi-asset class approach, I tend to pay attention first to lowering volatility and protecting myself against severe losses, thus staying invested in risky assets at all times while patiently allowing my portfolio to rise slowly - but without many hiccups. By doing so, I avoid the need to anticipate short-term stock market moves and can sleep better at night not having to worry much about catching the next uptrend. I am about to disagree with investment mogul Warren Buffett - twice! So, help me, goodness. According to the oracle of Omaha, "the best way for the majority of people to invest is to dollar-cost average into a low-cost S&P 500 mutual fund". It turns out that these are precisely my two last "don'ts" of investing: (1) dollar-cost averaging and (2) simply buying and holding an S&P 500 fund. Let's start with the first piece. To be sure that we are all aligned on the definition, DCA is the process of buying small "chunks" of an asset over time, instead of a lump sum today, in order to reduce one's risk of buying shares at a peak price. it works best in a downward-moving market. When the market moves up (which it tends to do, over time), lump-sum investing will usually result in a lower average per-share cost. it rests on the faulty logic that investing later is better than investing now. 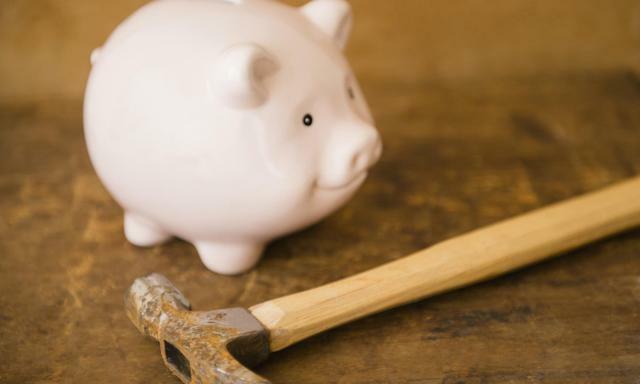 it can often be confused with the much more useful automatic investment plans, which are designed to redirect part of someone's paycheck, for example, to an investment account instead of being immediately available for spending. it forces investors to hold cash in their growth portfolio, when all of the capital could have already been put to work. To invest in SPY all at once, immediately after receiving her cash prize. To DCA her investment in equal installments of $1,000 over the first 12 months, then holding the portfolio steady for the remaining nine years. I have analyzed the performance of the two options above since 1950, running a total of over 700 scenarios - each one assuming that the investor received her $12,000 in a different month. The results couldn't be clearer or more predictable. See pie chart below. 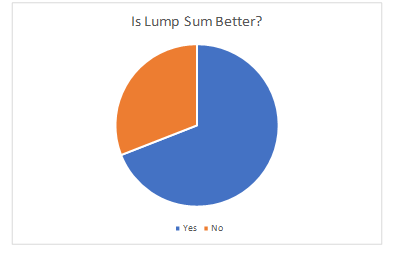 In 69% of the cases, investing in a lump sum vs. dollar-cost averaging across the first 12 months would have produced superior results. DCA proved to be a superior approach, not surprisingly, only if the lottery winnings had been handed to the investor during soft markets - the early part of the 2008 Great Recession, for example. Having said the above, I understand that there are certain psychological benefits to DCA. For example, some investors might be so anxious about investing in the markets (but then, why would they be involved in the markets to begin with?) that they find comfort in knowing that there is a silver lining to seeing equities head down in the near term. Another benefit of DCA is that it may encourage people to start investing, as opposed to suffer from "paralysis by analysis" and do nothing instead. I think it's better to invest slowly than to never invest at all. But in general, I believe that fear of buying at the top (or selling at the bottom) can be much more efficiently addressed using different techniques. For example, I believe that trying to smooth out a portfolio's performance is a better approach to mitigating the risk of buying high and selling low than through the use of DCA. As I have argued in a recent article, "it's never a bad time to own risky assets, provided that they properly complement each other in a well-diversified, (ideally) multi-asset class portfolio". A more balanced investment approach tends to produce less volatility, as I have often observed in my backtests. And, as a result of the less bumpy ride, the chances that an investor would buy into a portfolio at peak price levels should decrease. At worst, in the case of a highly concentrated stock-only portfolio, I believe that jumping in head first is still likely to be a better strategy for a growth investor than slowly dipping one's toes in the water. Because I have already made my argument against stock-picking a few times in the past (feel free to revisit my discussion), it seems counterintuitive that I would advocate against a passive approach like simply owning shares in an S&P 500 fund. So, let me put things in perspective. Picture a "spectrum of possibilities" in equity investing (see graph below). Towards the left, there is stock-picking, the "art" of identifying great stocks at the right time, buying and then holding them until the investor decides that they should be sold. This is a good example of active investing. Towards the right, there is the "set it and forget it" strategy of simply buying the S&P 500 and holding it for a long time, perhaps the best example of passive investing. I recognize that buying SPY is probably a superior long-term strategy to most others, particular active ones, pursued by a large number of investors in the market - e.g. growth, momentum, long-short, chase the trend, etc. However, I have previously discussed the pitfalls associated with traditional index investing. More specifically, the S&P 500 might not be as well diversified as many investors may think, since it uses a market-cap weight approach to doing so - i.e., larger companies tend to have more of an impact in the index's performance. As of this time last year, the S&P 500 allocated a very meaningful 51% of its hypothetical assets to two highly pro-cyclical broad industries: tech and financial services (the S&P has since changed its sector classifications). As it turns out, these have been two of the four most volatile sectors in the U.S. stock market since May 2000, alongside energy and materials. See graph below. Diversifying across stocks, I would argue, goes beyond merely increasing the number of holdings in one's portfolio. It should also involve better risk-balancing it. In other words, without any reliable insight into whether tech or healthcare or telecom (let alone which companies within each of these subgroups) will outperform in the future, I believe it is most prudent for investors to allocate a larger chunk of one's assets to sectors that are expected to produce lower volatility. As a proxy, I find it reasonable and practical to use past performance to determine which groups of stock will likely undergo a less bumpy ride in the future - understanding that this is probably not a perfect approximation or predictor of the future, but hopefully, one that is good enough. 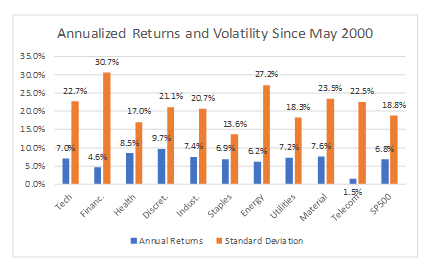 As the graph below depicts, weighing a portfolio more heavily towards less volatile sectors instead of simply investing in the S&P 500 index has produced substantially better results over the past 18 years at least. 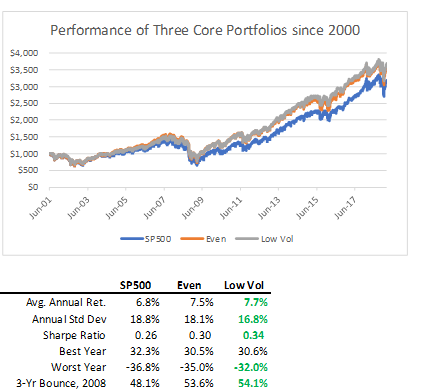 A "low vol" stock portfolio (grey line) has outperformed the benchmark by 90 bps in absolute terms, while being much less exposed to volatility. The low vol portfolio has also had higher lows than the S&P 500 and, perhaps surprisingly, has bounced more strongly from the 2008 recession. To reiterate, investing in the S&P 500 through low-cost funds is, in my view, a good "starter" strategy for investors who do not intend to spend too much time and effort overseeing their portfolios. But I would encourage those who do to add a "smart beta" layer to their approach. As I have mentioned repeatedly, I believe that a risk-balanced, multi-asset class approach has diversification benefits over a plain investment in the S&P 500 that should not be ignored. But even in the context of an all-U.S. equities portfolio, I believe that it can be better diversified and ultimately perform more strongly if a market cap-agnostic or volatility-based allocation methodology is used instead. Simply equal-weighting a portfolio, perhaps by buying shares in a number of sector ETFs and rebalancing them periodically, is a great first step. An even easier approach might be to look into low volatility stock ETFs like iShares' (USMV) or Invesco's (SPLV), both of which have outperformed the benchmark on an absolute basis over the past 12 months and five years. Hopefully, I have encouraged readers to critique a few of the most common "must do's" of investing that I believe would be better classified as "don't do's" instead. In my view, challenging the status quo is what's at the heart of being a contrarian investor - a select group of rebels and free thinkers that I like to believe I belong to. I suspect there are many other "don'ts" that did not make my short list today, but that still deserve an honorable mention - use the comments section below to help me unearth some of them. Maybe I can extend my list of common investment pitfalls and address them in more detail in future articles. Interested in learning more? The whole idea behind my Storm-Resistant Growth (or SRG) strategy revolves around the concepts described in this article. Since 2017, I have been working diligently alongside my SRG premium community on Seeking Alpha to generate market-like returns with lower risk through multi-asset class diversification. To become a member of this community at 2018 prices and further explore the investment opportunities, click here to take advantage of the 14-day free trial today. Disclosure: I am/we are long KO. I wrote this article myself, and it expresses my own opinions. I am not receiving compensation for it (other than from Seeking Alpha). I have no business relationship with any company whose stock is mentioned in this article.